Welcome back to another exciting episode of the NaCreSoMo 2014 CS mini-tutorial. Today we’re going to pick up where we left off in episode 1 by building a parser that uses the output of our lexer. A parser is another core part of a compiler: it takes the “words” (tokens, remember?) that come out of the lexer and tries to understand what they mean. If the lexer is about turning letters into words, a parser is making sentences. 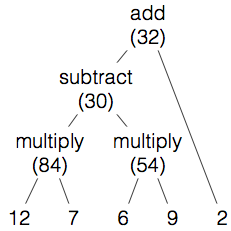 Before we start coding (and for those who aren’t going to follow along with the code), let’s look at a concrete example of parsing that pretty much everyone is, well, forced to learn in elementary school: PEMDAS. If you said “704” or even “-708”, you’d be on the right track. But it’d be weird if you said, say, “32”. Oh wait, sorry, I got that backwards. If you had never seen our arithmetic notation before, all you really have is a series of numbers and symbols: 12, •, 7, -, 6, •, 9, +, 2. (This is basically what comes out of a lexer!) How do you go from that to something you can actually calculate? Just grouping up the operations from left-to-right gives you the wrong answer. Of course, most programming languages aren’t arithmetic problems. Instead, they describe a format—a grammar—for a particular set of instructions. When the user puts in code that matches the grammar, the parser can interpret the “sentences” and “phrases” (known as productions), and build up some structure to represent the information. The rest of the program then uses this structured information to accomplish some task; an “interpreter” will treat it as instructions about what to do next, a “compiler” will use it as the description of a new program it can then write out to a separate file, and so on. Here’s a snippet of BASIC code that reads in a number and prints its factorial. Every line starts with a number. “INPUT” means “read from the user”. Whatever follows it is the name of the variable to read into. “LET” puts a value into a variable. It’s followed by a variable name, an equal sign, and then some kind of expression. (Here we have both “1” and “F * L”). “FOR” and “NEXT” go together – whatever’s between them is run several times. The “FOR” is followed by a name, an equal sign, a starting value, the word “TO”, and an ending value. “PRINT” shows something to the user. Whatever follows it gets printed. “END” ends the program. It doesn’t have anything following it. 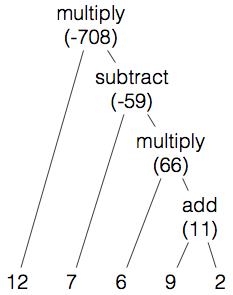 When the structure represents code, it’s often called an abstract syntax tree. It’s “abstract” because it doesn’t exactly reflect the actual text any more. It’s “syntax” because it’s still based on the grammar of the language. 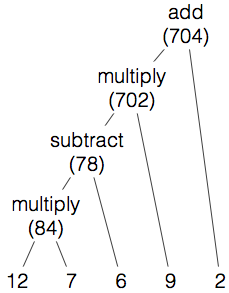 And it’s a “tree” because of the hierarchical structure. So, what are we actually going to build today? How about we come up with a grammar that describes state machines? We might want to name states, so let’s allow state labels to be either numbers or quoted text (like "abc"). We need a way to say that a state is a final state. We can write that as “final state 2”, or just “final 2” because the “state” is kind of redundant. We need a way to specify the start state. Let’s write that as “start state 3”, or just “start 3”. Oh wait…it’s possible for the start state to also be a final state. “start final state 4”? Or just “start final 4”? Works for me! Okay, that’s pretty good for states. How about transitions? Let’s say that after a new state, you put all of its transitions. If we just want to match specific text, let’s put it in quotes. "abc", '@', etc. We should allow things like “any letter”, too. If we want to exclude things from an “any” pattern, we should allow you to put them first and have them transition to “error”. After we’ve matched something, we need to know which state to go to. Aaaand…that’s pretty much it! If this exercise felt contrived to you, well…that’s pretty much how all of CS works. We made it up. Can you write a description of the Animorphs machine? The Star Wars machine? Hey, that’s pretty good! Now we just have to do those other two pieces: parsing each kind of production. There’s a bit more code this time, so I’m not going to put it here at all. Once again it’s available as a Gist on GitHub, along with a modified version of the lexer from last time. You might notice there are a lot of things missing from our pseudocode—for instance, it doesn’t tell check that all the transitions go to real states, or that all the states have unique names. That’s not usually a parser’s job—like the famous “Colorless green ideas sleep furiously”, grammatical correctness does not necessarily imply meaning. We’ll tackle these issues next time, along with actually building and simulating a state machine based on one of these descriptions. Postscript: “If this is where the tutorial was going all along, why check for parentheses and the comma in the lexer? They’re not actually used here!” Well, actually I was originally going to try to parse patterns (like those from the “What are Regular Expressions?” chapter). Then I realized that arbitrary pattern matching (including backtracking) is hard, and that I was writing some pretty hairy code to make it work. Although I think I got it working in the end, it wasn’t a great tutorial project.